Some users prefer to have an icon on their desktop that, when launched, automatically runs their sync silently and hidden from view. Use this document to create an AppleScript that will run a sync document silently as if it were being run from ChronoSync’s background scheduler. 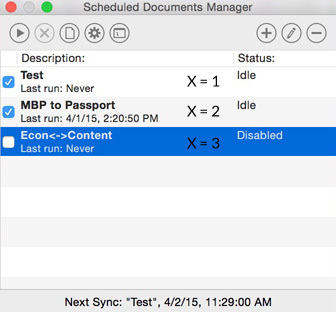 Use the following steps to create a schedule for your sync document, then create the AppleScript to run the scheduled item. This procedure makes use of the AppleScript Editor which can be found in the Applications->Utilities folder. First create a dummy schedule to be run via AppleScript. This can be done by clicking the ‘Add to Schedule’ button from the toolbar of the saved sync document, leaving the scheduled settings at their default, and saving the schedule. To prevent this schedule from running automatically per the scheduled settings, uncheck the schedule in the Scheduled Documents Manager window as shown in the screen grab below. Note: On older versions of ChronoSync, (Pre 4.6.0) substitute 'ChronoSyncBackgrounder' for 'ChronoSync Scheduler'. Replace 'X' with the number the scheduled item is in the SDM window. For example, if I wanted to run the 'MBP to Passport' scheduled sync shown in the screen grab above, I'd use the value '2'. Click the 'Compile' button in the AppleScript Editor toolbar. Check for any errors. Now, test the script. Remember, if everything works, the sync document should open and begin syncing! Now click the 'Run' toolbar button. Does the sync get launched? Correct any errors before continuing. Sep-2-2015 - Noted the v4.6 change of the 'ChronoSyncBackgrounder' to 'ChronoSync Scheduler'.